Our immune systems are constantly engaged in battling viral infections. Credit: Lisa Brown. Scientists have discovered that a biological molecule important in cell growth (STAT3) is also critical in protecting us against infection - so much so that we would be unable to fight the common flu virus without it. Their discovery could pave the way to the development of new therapeutics charged with restoring our natural immunity to a whole spectrum of viruses that have evolved 'roadblocks' to the immune response. The team behind the work was led by Assistant Professor in Immunology at Trinity College Dublin, Dr Nigel Stevenson. The findings have recently been published in the journal Cellular and Molecular Life Sciences. In a world of newly emerging viral infections such as SARS, ZIKA and Ebola, the importance of understanding how viruses target our immune system, and the need to develop new therapies to cure and protect us, has never been greater. 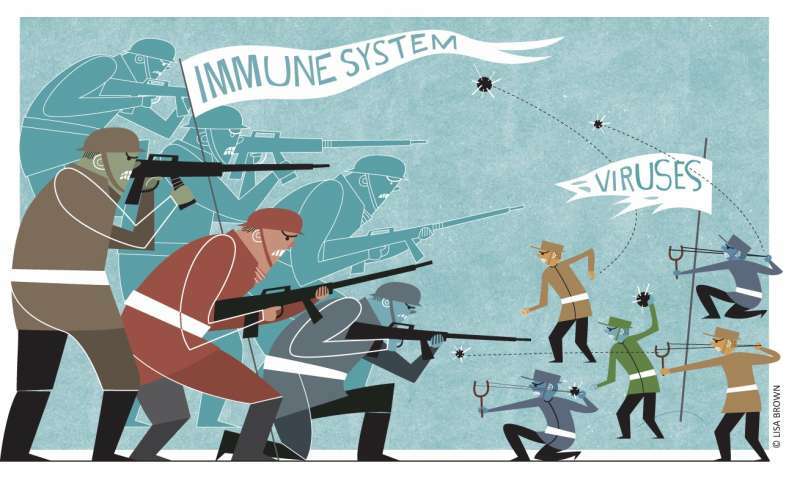 During any viral infection our cells produce an immune molecule called Interferon, which essentially 'interferes' with the battle plans of attacking viruses—preventing them from replicating in our bodies. When our cells are stimulated by Interferon a cascade of molecules within our cells is activated like a series of dominos. When the final one falls, the cell should be able to clear the viral infection. This cascade of molecules is termed a signalling pathway as it passes the 'danger signal' of viral infection through the cell. The Interferon signalling pathway initiates the production of several hundred immune molecules that act to destroy viruses and amplify our immune response against them. However, as we know, many viruses are not cleared by our natural immune response and can often cause serious illness. Immunologists from Trinity, wondering how viruses suppress the immune response, have discovered that they have evolved numerous methods to inhibit these signalling pathways and thus block responses to Interferon. Dr Stevenson said: "We thought that since the Interferon signalling pathway enhances the immune response against viruses so effectively, viruses might have evolved means to block it - such a reality would explain why several viruses are so troublesome to defeat." Indeed, over the past few years, Dr Stevenson and his team had discovered that Hepatitis C Virus (HCV) and Respiratory Syncytial Virus (RSV), among others, specifically target the Interferon signalling pathway which helps them avoid being naturally cured by our immune systems. Scientists had, until now, believed they fully understood how the Interferon signalling pathway worked, but by using a series of viral infections and cutting-edge molecular techniques, Dr Stevenson's team discovered a new anti-viral role for STAT3. Dr Stevenson said: "For decades we have known that STAT3 is essential for healthy cell growth, but our new revelation identifies it for the first time as an essential anti-viral component in the Interferon signalling pathway. In fact, we found that without STAT3, cells cannot fight the common Flu virus or the Pox vaccinia virus." "Of course a major goal of our ongoing work is to find solutions to the real-world problems faced by the thousands of people who cannot clear certain viruses after they have been infected. This discovery opens the door to new therapeutic options, which, we hope, will be able to help people restore their natural immunity against a host of problematic viruses."